The only kind of noodz I like: saucy ones. That rainy Tuesday afternoon in Newark, I knew. The outside world, cold and bleak, seemed like paradise. It seemed I was held hostage inside the hip headquarters of every millenial’s dream company, pumping out ad campaigns. Just three desks and a glass window away was a grayer place. But out there––there were no walls. No HR paperwork or stray pen caps. No computer that I’d have to hunch over every day, plugging in words that were supposed to be meaningful. My life on the other hand, felt meaningless. But I should have been more grateful, right? Looking back, those office walls shielded me from what was to come. The grass is always greener or in this case, consistent paychecks, subsidized healthcare and paid vacations smell sweeter when I’m scrambling for rent. Or dreaming of the next vacation I can’t afford. And it’s especially depressing when I aimlessly scroll through my inbox for catering opportunities. Clicking on “Subject line: January 2018 Seasonal Hours” led me only to a reminder that I needed to unsubscribe from junk mail. No new work; not yet at least. Earlier today, feeling defeated, I desperately started to look for jobs that resembled the one I left behind two years ago, before I started my own business. And certainly before I threw myself head first into the wild unknown. But every job description made me cringe. Because going back would mean leaving behind the cold and bleak, but also the paradise this newfound professional freedom has afforded me. With the start of this new year, I will only look forward. The journey might not be pretty, but it will be meaningful. Having only dreamt this up recently, I knew I had to give it a try. Though the noodle texture isn’t comparable to the gluten/wheat version, it’s tasty in its own way. Plus, it’s filling and healthy and worth trying anyway. Whisk all ingredients (or blend in blender). Set aside. Mix together first three ingredients in medium bowl. Slowly mix in boiling water. Blend until sticky crumbs form. Then, knead with hand until ball forms. Set aside. Flour large cutting board and rolling pin with rice or tapioca flour until covered completely. 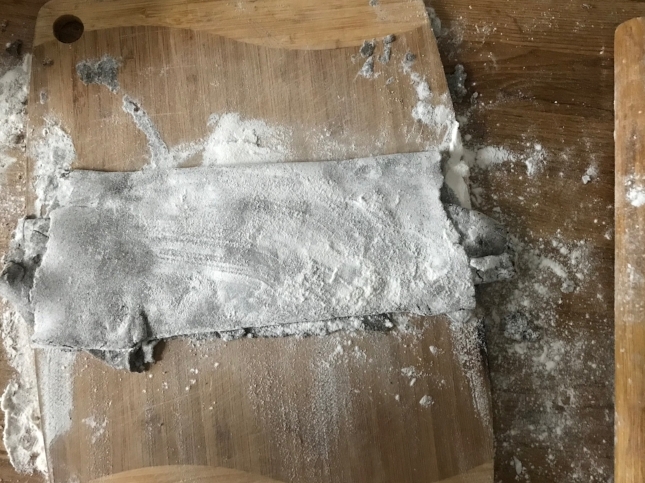 Roll out dough, flouring board and pin every so often, into a thin, rectangular sheet about ⅛-¼ inches thick. You can fold the thin sheet of dough three times to slice, but because it’s so delicate as gluten-free dough tends to be, you can just carefully slice thin noodle strands with a knife. Set noodles aside. Boil water in a medium saucepan. Once water bubbles, cook noodles for 2-3 minutes. Strain and serve immediately with sauce.